This week, Floyd Mayweather officially announced his next fight will be against 22-year-old wunderkind and unified junior middleweight champion, Saul “Canelo” Alvarez on September 14. Let’s cut to the chase: This will be the biggest fight in boxing this year. This is the biggest fight that could have been made this year (sorry, Manny Pacquiao). Financially, this has a decent chance to be the biggest fight of all-time. In other words, get prepared to spend the next three months being inundated by high-pitched uninformed opinions from the likes of Colin Cowherd, Skip Bayless, and Steven A. Smith. Expect to have Floyd Mayweather’s potential place in history debated ad nauseam. Brace yourself for dozens of interviews in which Floyd Mayweather discusses Floyd Mayweather in the third Floyd Mayweather. Since you’re not going to want to sit through all that, I’ve prepared this handy guide of everything you have to look forward to and everything you have to dread. This Fight is Legitimately Huuuuuge: Haven’t heard of Canelo Alvarez? Then you definitely aren’t from Mexico. Alvarez has a massive following in his home country where he turned pro at only 15 years of age (at least if you believe his birth certificate – some don’t) and racked up more than 30 wins before turning 20! His matinee idol looks (our friends at Grantland described him as a cross between Blake Griffin and Matt Damon), undefeated record, and compelling storyline got him signed to Golden Boy Promotions and imported to the US as a pay per view attraction at the tender age of 19. Right now, he’s the third most marketable star in boxing, behind only Mayweather and Pacquiao. If he wins this fight, he’ll surpass both. This is a Real Fight: Floyd Mayweather opened as a significant -250 betting favorite, and rightfully so, but make no mistake: this is the first time Mayweather has faced an opponent who has a legitimate chance to upset the applecart since he squared off with Oscar De La Hoya –now Canelo’s promoter – more than six years ago. Canelo is young and has his shortcomings, covered below, but no one disputes his power or his will to win. To accomplish what he has at his age takes special talent, no matter how carefully De La Hoya and Co. have managed his career. Mayweather gets a lot of guff for ducking opponents, as he should, but everyone should tip their hat to him for taking not only the biggest fight but also one of the most challenging. Mayweather Shows Up Every Time: For all the negative things you can say about Floyd Mayweather, one thing you can’t accuse him of is showing up unprepared for a fight. Mayweather has had good fights and great fights, but never a bad one. He’s never shown up with an ounce of fat on his chiseled frame. He’s never faded down the stretch of a tough fight. While he can act like a pompous spoiled child outside the ring, he’s nothing but a consummate pro inside of it. Canelo Can Flat Out Hit: The great unanswered question of Floyd Mayweather’s career is what will happen if someone finally cracks his shell defense. We know he can be wobbled by a big punch – Shane Mosley briefly had Mayweather on Queer Street (take note, casual boxing fans: not a homophobic slur) before Mayweather recovered and dominated the fight – and Zab Judah, Ricky Hatton and even Chop Chop Corley have also inflicted noticeable, albeit ephemeral, damage in the past. But, despite this vulnerability, no one has ever put Mayweather down: the only time Mayweather has ever officially touched the canvas in his career is when he broke his own fragile hand on a hard punch against Famoso Hernandez and dropped to the mat in pain. Canelo could be the man who changes that. Canelo doesn’t have the sort of blazing speed that leads to one-punch knockouts, but he can crack like the last great Mexican idol, Julio Cesar Chavez. Each punch is like a sledgehammer blow that crushes bone, bruises organs, and bursts blood vessels. Undoubtedly, Mayweather will block or slip the vast majority of these heavy blows, but Canelo is dogged and strong. If he can back Mayweather against the ropes and flurry, some of those punches will get through. What happens next is anyone’s guess. Canelo’s Defense Is Underrated: I’ll bet you already knew that Floyd Mayweather was the hardest man to hit in the ring, but you probably never would have guessed that a straight up brawler like Canelo Alvarez is right up there with him. According to their plus/minus rating (percentage of punches landed minus percentage of opponents’ punches landed) Canelo is second only to Mayweather among current fighters, with a plus/minus rating of +18, putting him ahead of defense-minded fighters like Andre Ward (+14), Guillermo Rigondeaux (+13), and Wladimir Klitschko (+13). The unfortunate news for Canelo? Mayweather is at +24. Canelo May Not Be Ready: For all his gifts and time in the ring, Canelo has fought against a top opponent in his prime only once, Austin Trout in his last bout. Although he won and dropped the iron-chinned Trout, Canelo looked sloppy at times and still seemed to fight in spurts before tiring himself out. Mayweather is a master at exploiting his opponent’s mistakes. If Canelo wings sloppy punches, like he did with Trout, Mayweather will slip them and counter, making Canelo look foolish in the process. Canelo’s other big wins have come against faded former champions or guys who never were more than borderline contenders. How will he handle stepping into the ring where, for the first time, he is both not the featured attraction and his opponent is one of the best fighters on the planet? We just don’t know. Canelo’s Style is Made for Mayweather: An old axiom in boxing is that “styles make fights.” This is why Joe Frazier was every bit the equal to Muhammad Ali in each of their three fights, but no match for George Foreman, who Ali famously knocked out in Zaire. Well, Canelo’s style seems to be made for Mayweather. Canelo fights with his hands held high, but wide apart. As noted above, most fighters have been unable to split this guard, but Mayweather is a completely different beast. Look for him to be sending pinpoint lead rights up the middle every chance he gets, tattooing Canelo’s nose and eyes. Canelo also tends to wing his powerful right hands and left hooks out in big looping blows. It’s the sort of punch that lots of guys don’t see or can’t avoid, but that Mayweather will slip with ease, setting him for a wide-open counter shot. 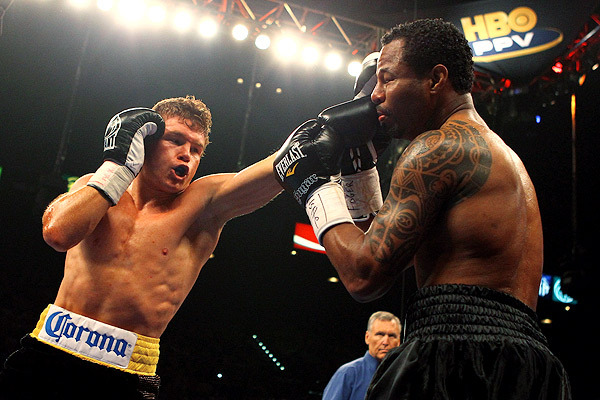 And the punch that Mayweather struggles most with, the jab, is a punch that Canelo has traditionally under-utilized. If he wants to win the fight, Canelo will have to aggressively cut off the ring and force Mayweather to fight off the ropes, where his defense can break down a bit. Well, good luck with that. It’s on Showtime: Showtime paid through the nose for the rights to Floyd Mayweather and Golden Boy’s stable of fighters in an effort to put the squeeze on their rival and longtime boxing leader, HBO. But, even with the best fighters in the ring, they’re still no match for HBO’s production quality. Everything from the theme music, to the commentators, to the interviews pales by comparison. Watching a great fight on Showtime is a bit like seeing Robert DeNiro and Dustin Hoffman in Little Fockers. Mayweather Didn’t Get Rich by Fighting For Free: This fight might be the biggest grossing fight of all time and expect the pay per view prices to reflect that. Mayweather’s fight with little known Robert Guerrero cost $70 for HD. Expect the Canelo fight to cost at least $75, if not $80. Thinking about attending live? Good luck. Almost all the seats will be given away to the fighters, promoters and their camps, as well as media and casino high rollers. The few seats that will go on sale to the public will mostly end up in the hands of ticket brokers looking to get an exorbitant markup. Oh, and Las Vegas hotel and entertainment prices will reflect the anticipated influx of big shots. Mayweather Will Probably Win a Dull Fight: It is what it is. Deal with it.